Prior to cinemagraphs, comment threads, 140 character limitations, and photography, there were Broadsides. Serving as the primary mode of communication for artists and writers around the turn of the 18th century, it was a way for the artist and writer to relay messages to the public. 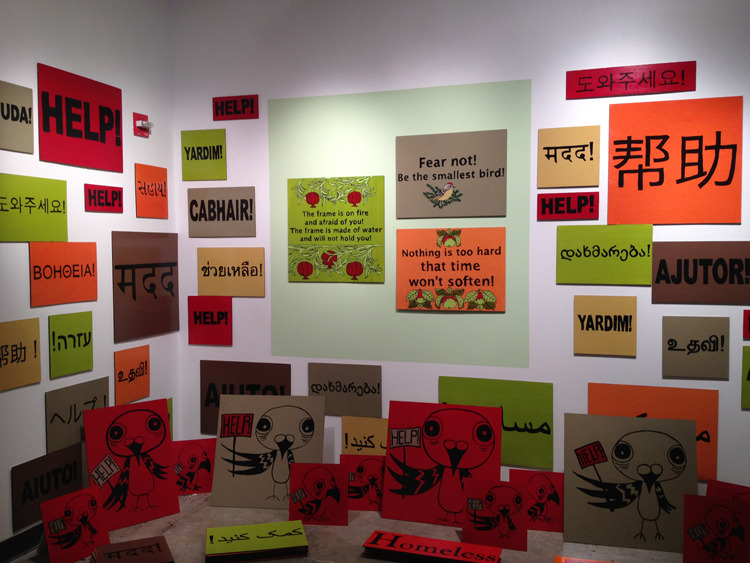 Although one-sided, broadsides gave the viewer an experience of art regardless of their socio-economic status in that broadsides were posted in public spheres where anyone with the ability to read had access to text and image. With no digital divide or privileged information, the broadside may even be considered an early form of urban art, one based heavily on its environment and region. One example that comes to mind is the consideration of the location and posting of broadsides being dependent on the most highly trafficked areas of a city. However, physical location doesn’t mean too much in regard to the information we send and receive--the constant and instantaneous feedback and engagement of the audience seems to be a facet of social interactions, which spill over into contemporary art. Thus, the importance of showcasing traditional and new forms of interaction in the scope of art and literature is valuable and reflective of how communication has progressed and evolved. The exhibition, “Broadside Attractions and Vanquished Terrains” curated by Maw Shein Win, Megan Wilson, and Intersection for the Arts director, Kevin Chen, included twelve pairings between artists and writers. The task incorporated a process of interpreting the craft of the broadside based on a film, a piece of music, and a place (real or imagined). Printmaking, drawing, sculpture, painting, and various tools of technologies (i.e., sound, digital photography, etc.) cover the spectrum of mediums used by the collaborating teams. The exhibition does not only explore the concept of the broadside but opens the viewer up to the remnants and byproducts of the creative process of artists and writers, and the relationships between the two. As the viewer reflects on this particular mode of communication, the images, text, space, and performances commingle to revitalize the broadside as the attraction by asking the artist to create an accompanying work show alongside the broadside. With a nod to the "new" technology, it was possible to use your smartphone to access the information the artists and writers used as grist for their mill. 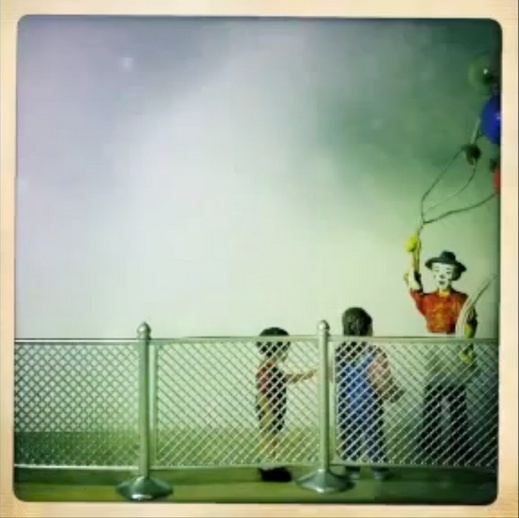 Similar to Cortez’s text, Inaoka’s stop-motion video tells a story that warrants an almost infinite loop of observation. In the content of each frame, Inaoka seamlessly tells an equally mysterious yet engaging story of miracles and memory through simple transitory compositions. Viewers may find themselves reading the text or watching the stills over and over again to capture something that may have been missed as they gain a different meaning each time. Karrie Hovey and Elise Ficarra (along with Evelyn Ficarra) created a large-scale sculptural piece tmade up of incredibly organic shapes and forms that wrapped around the spiral staircase near the Intersection for the Arts gallery entrance. 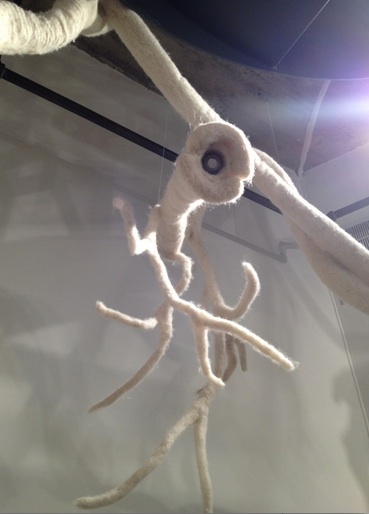 Walking on the spiraling stairs, forms of deer, antlers, and branches made from felt come into view. Translucent words were sprinkled throughout, and sounds from nature emanated from embedded speakers. The sense of hearing something natural against concrete and metal was reminiscent of the urban landscape where humans try desperately to preserve a sense of the natureal with our rooftop gardens atop corporate buildings and parks surrounded by cars. Hovey and Ficarra’s piece harked back to days when people found themselves outside of the home learning more about life through the written word and their physical environment rather than through a virtual world. Lastly, audience participation played an integral role in the collaborative work of Liz Worthy and Jenny Bitner. As an exercise in relational aesthetics, Worthy and Bitner take on the idea of Sunday tea complete with friendly interaction. 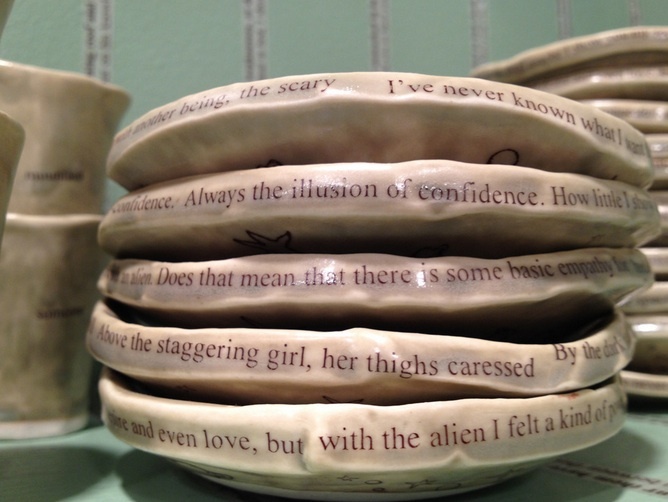 Yet, within the physical space and the objects, such as the tea cups, the table, the dishes, and the cookies, the piece calls upon something deeper from the participant - an intimate moment. Whether the intimate moment was with a friend or one of the artists, an exchange rooted in a reading of Bitner’s piece, Confession expands the idea of intimacy in that it asks the reader to question their own relationships both "real" and "online". 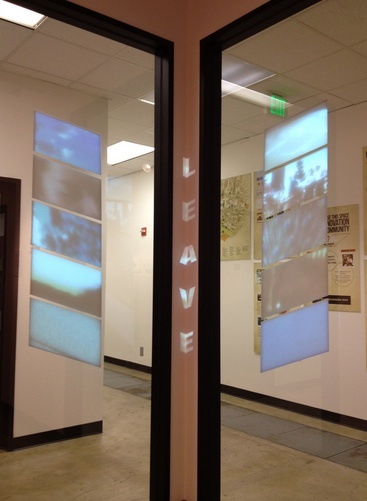 The work uses a sense of whimsy and playfulness as it asks participants to ponder their own idea of interaction and engagement with others; in this space, the viewer is asked to engage with objects and people in real time in actual physical space. — Dorothy Santos is a freelance art writer, blogger, curator, and photojournalist. She holds Bachelor's degrees in Philosophy and Psychology from the University of San Francisco. She is a contributing writer and curator for Asterisk San Francisco Magazine and blogger for ZERO1: Arts and Technology Network.